I was part of the We Grow Retreat 2018, hosted by Universal Studios, Orlando. This post is part of that partnership. All opinions are my own. Headed to The Wizarding World of Harry Potter with the family? 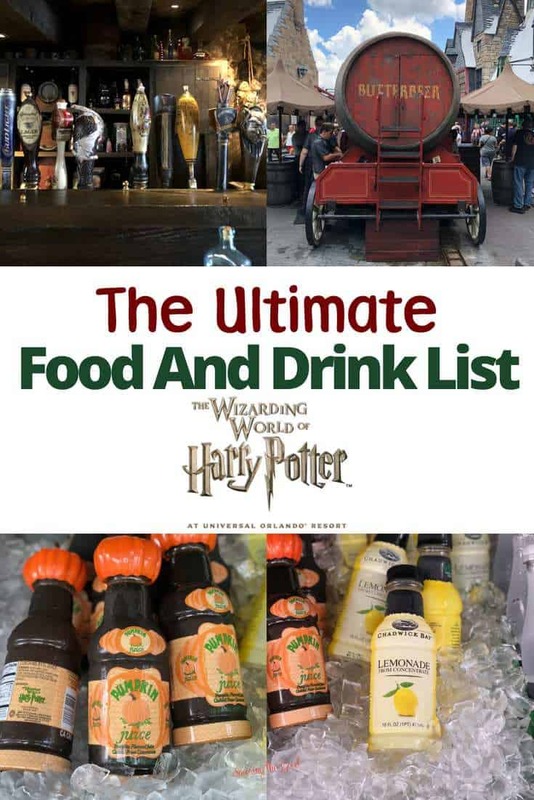 Here is the ultimate food and drink list for muggles visiting Universal Orlando Resort. The Wizarding World at Universal Orlando is known for butterbeer and chocolate frogs but what else is there to eat and drink when you visit Diagon Alley? Here are the most under appreciated snacks, treats and drinks for wizards, muggles and witches, alike. What is there to eat at Wizarding World of Harry Potter, besides chocolate frogs? The food in the Wizarding World, Orlando is not like your typical theme park food. The food is well thought out, indicative of the Harry Potter books and full of flavors. Snack and drink carts are available to keep you fed and hydrated and themed restaurants will make you feel like you have stepped into the books. Pub meets inn you can eat where Harry stayed there for several weeks over the summer before heading off to Hogwarts for his third year in Harry Potter and the Prisoner of Azkaban. Ploughman’s – Serves 2 <— GREAT value! Satisfy your ice cream sweet tooth at Florean Fortescue’s Ice-Cream Parlour! Located in Diagon Alley in Universal Studios, Orlando I challenge you to get something OTHER than butterbeer ice cream. My personal favorite is the Earl Grey & Lavender with Clotted Cream in the same dish! Creative flavors in a magical place! 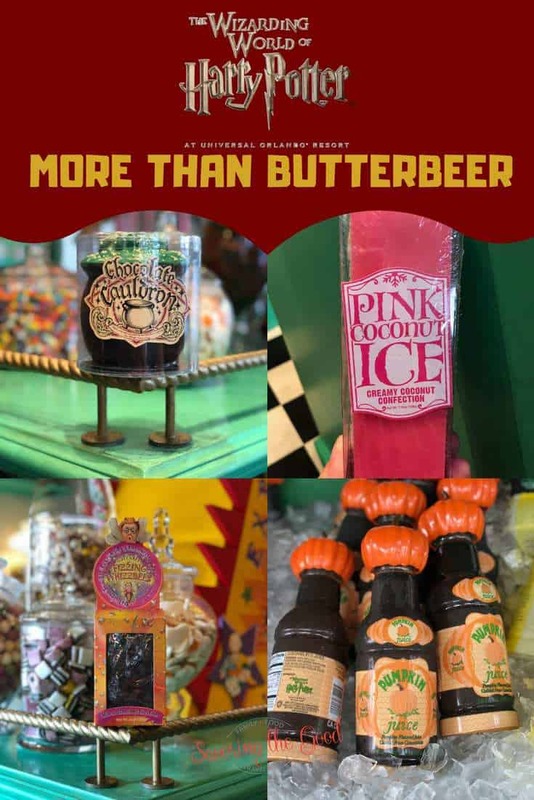 If you are not paying attention you might miss the small beverage kiosk located in Carkitt Market inside The Wizarding World of Harry Potter – Diagon Alley! This is the spot where you can purchase little tubes you’ll find a variety of elixirs that, when combined with water, transform regular water into unique, colorful, and flavorful beverages. Pro tip: the potions are sold individually. You can add them to any bottle of water, not just the Gilly Water that is sold beside the potions. A great souvenir to take home the the muggles who couldn’t take the trip. Located in the heart of Carkitt Market at The Wizarding World of Harry Potter – Diagon Alley this is the walk-up counter where you can grab variety of delicious drinks, with or without alcohol. Be sure to watch a live performance by Celestina Warbeck and the Banshees while you sip and savor. Is butterbeer at Universal alcoholic? Butterbeer at Universal is non alcoholic. It does not take like beer but more of a creamy, caramel soda. Butterbeer is available chilled, frozen and warm in the cooler season. When visiting Diagon Alley in Universal Studios Florida and you need a refreshing beverage or a place to escape from the 4:00 rain storm, stop in the Fountain of Fair Fortune. They have both alcoholic beverage and non-alcoholic beverages for all the muggles in your party. What is the Grand Feast at Three Broomsticks at Universal Studios, Hogsmeade? If you are looking to feed our family and get the full Wizarding experience, get the Grand feast. First course is a fresh garden salad tossed with signature vinaigrette dressing. Main course will be a combination of rotisserie smoked chicken & spareribs, corn on the cob, and roast potatoes. Something for everyone and no one will go away hungry. Serves 4 people but additional servings can be added to your bill. Traditional English Breakfast -Fresh scrambled eggs, sausage links, black pudding, English bacon, baked beans, grilled tomato, sautéed mushrooms and breakfast potatoes. Porridge Breakfast- Old fashioned steamed oats with fresh fruit and butter croissant. Continental Breakfast- A colorful array of fresh fruit served with croissants accompanied with assorted jams. American Breakfast – Fresh scrambled eggs, breakfast potatoes, crisp bacon, and link sausage with butter croissant. Pancake Breakfast- Three fluffy buttermilk pancakes, crisp bacon, and link sausage with butter croissant. Fish and Chips- Fresh north Atlantic cod battered & fried with chips and tartar sauce. Shepherd’s Pie with Garden Salad – Ground beef, lamb & vegetables crowned with potatoes. Beef Pasties with Garden Salad – Flakey pastry pies filled with ground beef, vegetables & potatoes served with a side salad & choice of dressing. Rotisserie Smoked Chicken Platter – Served with corn on the cob and roasted potatoes. For ages 9 and under. All meals served with grapes & applesauce. You will know you have arrived when you see the giant hog’s head hanging behind the bar. Hog’s head is located IN Three Broomsticks. Don’t worry about waiting in line for food… just go in the tavern door and get in the beverage line for the full service bar. Pro tip: This is the only place on property to find the Hog’s Head Brew. What snacks are there to eat at the Wizarding World of Harry Potter? My favorite place to get a sweet treat or snack is Honeydukes in Hogsmeade. You walk in and the store smells like what you thought the store SHOULD smell like, sugar, chocolate and magic. All the treats, as well as EVERYTHING in the park, has been approved by J. K. herself. How much does it cost to get into the Wizarding World of Harry Potter? There are two parts of the Wizarding World of Harry Potter, Universal, Orlando. You will find Diagon Alley at Universal Studios and Hogsmeade at Island of adventure. If you have the Park-to-park ticket option take the Hogwarts Express between the two worlds! A base tickets for one park starts at $115. A park to park ticket starts at $170. Saving on Universal Orlando tickets. Purchase your multi day tickets on line and save up to 20% over gate prices. Stay at a Universal hotel property for added park perks on tickets and more!